An evil South American dictator named Ortega runs a “drug camp” and former Vietnam buddies Ray “Smithy” Smith (Gaines) and Mark Mitchell (Rom) are called in by the government to shut it down permanently…using any means necessary. After Mitchell is captured and imprisoned by Ortega’s goons, Smith goes undercover in the drug camp to break him out. Once the men are reunited, no force on earth can stop them. But they’re going to have to be careful – Ortega then captures Mitchell’s sister Carol and now the mission of the two warriors has to alter to rescue her from the clutches of the sinister and nefarious Ortega. Will the mission succeed? Crime Stopper (AKA Lethal Killing Machine) is an amazingly fun cocktail of wackiness and non-stop violence that only could have arisen in the Philippines in the early 90’s. We have been Teddy Page fans for a long time, and only now have we discovered that this is one of his best and most all-around entertaining outings. It’s also one of the all-time best “30% New Footage!” movies we’ve ever seen, putting most of Godfrey Ho’s catalog to shame, as Crime Stopper has recycled Rom footage from his other outings such as Blackfire (1985) and Double Edge (1986). Does any of it make sense? No. Do we care? No. Would we have it any other way? Of course not! First there are some unknown men shooting at each other and chasing each other. Then some different guys are beating the snot out of each other in a kickboxing match (one of which is Ned Hourani). Then more unknown men shoot at them with machine guns. Then a car blows up. Then a grammatically-questionable title card appears on screen to explain (?) what we just saw. Then there are some more blow-ups. Then some tanks enter the picture, and some more unknown guys are fighting a war. The viewer doesn’t know who is who. There is no explanation for anything at all. That’s when you surrender and go with the flow. Once you submit to the nonsensical charm of Crime Stopper, you will have a fantastic time. We can just about guarantee it. All you have to do is throw logic out the window and embrace the absurdity of it all. Mitchell is the White Guy and Smith is the Black Guy. Mitchell’s code name is Cobra. Smith’s code name is Black Mamba. That probably wouldn’t happen today. But maybe the Cobra code name makes sense because the filmmakers continually want to make the viewer think of Rom Kristoff as some sort of second coming of Stallone. Have you seen the poster for Double Edge? That should explain things. Even the title, Crime Stopper, seems to be a reference to Marion Cobretti’s obsession with crime statistics. Even though the movie has nothing whatsoever to do with stopping street crime, they went with that anyway. Just Jim Gaines walking down the street is an entertaining thing to watch in this movie because he looks cool, and you know something awesome is about to happen. He wears a T-shirt that says “Normal is Boring”, and when it comes to Crime Stopper, it couldn’t be more apropos. As far as the voices coming out of the characters’ mouths, there’s a lot of silly dubbing by silly men with silly voices. That alone is worth seeing. Or, more appropriately, hearing. Speaking of great stuff you hear, the score by Patrick Wales is terrific and deserves a CD/vinyl reissue. Hey, if they could do it for Striker (1988), they really should do it for this too. All in all, Crime Stopper is a movie right up our alley. It’s a non-stop parade of violence and nonsense. It’s fun, entertaining, and short. It makes no rational sense whatsoever, but something is always happening because the movie moves along at a fast clip. What’s not to love? Recommended. It’s funny how you reviewed this. Just the other night I stumbled across it on Prime and watched it for a laugh and wondered how you’d never got to it. 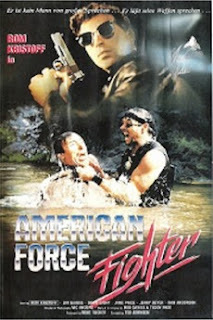 The kickboxing part where the two guys were shot to death was classic. The graphic describing what was happening is also one of the dumbest things ever captured on film. Overall a solid classic from the good old days. As I always ask myself, where did all go wrong? This was definitely one of the greats. Movies with Teddy Page and/or Romano Kristoff are always worthwhile. I recommend their collaboration Jungle Rats. Another underappreciated director from the Philippines is Jun Gallardo. The Gallardo/Kristoff movie Slash is classic ”Rombo”. The VHS cover claims he is deadlier than Rambo! These 90s actioners take me back to the glorious video store era! I definitely have to find this online. Force Field: Yes, there are some classic funny moments, and we ask ourselves where things went wrong all the time. You're not alone. Roger: We agree, Teddy\Rom movies are always worth a look. We're on the lookout for both Jungle Rats and Slash. We'll review them if we find them. We posted Gallardo's Firing Line and an SFX Retaliator review will be coming in 2019. Joseph: We also love celebrating the video store era, which is what we always try to do. 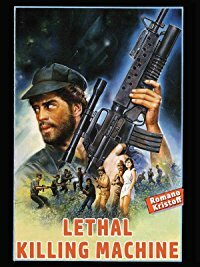 If you have Amazon Prime (in the US) Lethal Killing Machine (AKA Crime Stopper) is available as of November 2018...it could go away at any time! Jungle Rats is available on DVD with English soundtrack from Germany under the names Dschungelratten and Todeskommando Vietnam. Slash is VHS only so far. We're hoping Slash comes to Amazon Prime or YouTube soon!